Check for clearance between the board and casing. This is the first thing you should do – definitely if you have a problem with the wah not working, but also if the pedal works, but in a weird way. The circuit board and casing are designed to not touch each other, but it is possible that one of the new solder joints can reach down far enough. Simply lift the board slightly – if that fixes the problem, try snipping off the excess solder/wire and/or add some tape to the bottom of the case to form a shield. ”Hotwiring” the switch: This is really useful to rule out the switch itself as the problem. Simply desolder the appropriate wires from the switch and connect them together to verify the operation. Checking the bypass line: Desolder and connect the green and purple wires. You should get a clean bypass signal passing through. If not, there’s a problem with the wires themselves or the jacks. Checking the active line: Desolder and connect the green wire to the circuit input wire. Do the same with the blue wire (both, if there are two blue wires soldered to the switch) and the purple wire. You should now get the wah effect. If you get wah hiss but no guitar signal, the problem is either in the green wire (input jack -> switch) or the circuit input wire (the new one you soldered in place). If you get nothing at all, the problem is probably in the power section. The ”buzz” test: This is a quickie way to follow the signal through the switch. With a guitar connected to the wah and the output hooked up to an amp, simply touch various points on the switch to verify where the signal is lost. Buzzing the bypass line: Leave the pedal in bypass mode, and touch the tip connector (the innermost of the three) on the output jack. You should hear a buzz, signaling that the jack and cable to the amp works. Now touch the switch lug where the purple wire is soldered – if you don’t hear a buzz, the purple wire (or the circuit board trace from the multi-connector to the jack) is the problem. If you do hear the buzz, continue to the green wire (check both ends of the jumper on the switch, while you’re at it). Finally, touch the tip connector on the input jack. Wherever you lose signal, you’ll find the problem between that point and the point where you last heard the buzz. Buzzing the active line works basically the same, but you’ll need to follow the buzz on its detour through the circuit. The buzz points are: output jack tip connector -> purple wire -> blue wire(s) -> circuit input wire -> both ends of jumper wire/green wire -> input jack tip connector. If you did the TB mod and decided to keep the buffer in place, the most likely cause of this problem is that you simply forgot to cut the trace between the input jack and the buffer input. Or you did cut the trace, but failed to get the cut completely through the trace. The new switch is (assuming you followed my wiring instructions) wired to short the effect input to ground in bypass mode, and if that trace is not cut, the shorted effect input will affect the bypass signal as well. Note: if you did the TB mod with buffer removal, the trace doesn’t need cutting (and therefore can’t be the problem either). If you have problems with no bypass signal, it’s time to look closely at the switch wiring. Double-check your wiring against the drawing, and make sure the switch orientation (the way it’s turned before soldering) matches that of the drawing. If you accidentally turn the switch a 1/4 turn and then solder the wires in as if the switch wasn’t turned, nothing will work. First thing, check if the wah makes any noise at all. If you can hear the wah hissing (obviously changing its tone as you move the foot pedal) through the amp, double check the switch wiring. If you accidentally misplaced the circuit input and ground wires (white and black in the drawing), the switch will mute the input of the wah in active mode. This sometimes happens when people use 3PDT switches. Unlike a DPDT, which has a 3×2 layout, a 3PDT is uniform (3×3) so you have to know which way to turn it. To make it correspond with the diagrams on this site, turn it so the holes line up north-south (imagine being able to thread a needle through all three holes in a row – that’s one of the three switch sections). If you can’t hear any noise in the amp as you move the footpedal, it’s likely a power problem (see below). It works fine, but I notice a treble loss in bypass mode. I thought this ”true bypass” thing was supposed to be completely transparent?? Well, it is. Assuming your connections and solder joints are all good (yes, you can lose a surprising amount of signal through bad/cold solder joints), what you’re most likely hearing is cable capacitance. When comparing the wah’s bypassed tone to plugging the guitar straight into the amp (which is what I suspect you’re doing here – we are curious creatures, and want to know that what we just did works 🙂 ) you’re also adding a second cable from the pedal to the amp. That cable will be ”seen” by the pickups, and it will effectively double the cable length. Assuming both cables are of similar length, of course. So if you really want to find out what true bypass ”sounds” like compared to going straight to the amp, you need to take that second cable out of the equation. This is done either by adding a buffered/active pedal (Boss or similar) immediately after the wah, or by testing it with just a short patch cable from the wah to the amp input. If you still get treble loss in that configuration, it’s time to start looking closer at the wiring in the pedal. But try the buffered pedal/patch cable test first! When pedals are dead due to power problems, it’s almost always a short – either because the polarity protection has been activated (did you try a random adapter before it died?) or because the bottom of the board is physically touching the case. Finding a short in the power rail is easy if you have a multimeter – set it to ohms, and measure between the two connectors in the battery clip. If you get anything but infinite or close to infinite resistance, it’s a short. Another dead giveaway of a short is if the battery (try with a fresh one) gets hot. Assuming you’ve already ruled out the underside of the board physically touching the casing, the most likely points a power short can occur are the polarity protection diode and/or the filter capacitor (as marked in the pic to the right). If the pedal has been subjected to the wrong adapter, these two (or sometimes just the diode) tend to short out. That’s actually a good thing, since it protects further damage to the circuit. Anyway, replacing both should do the trick. If the pedal powers up as soon as they’ve been removed, they were the problem. But do replace them before using the wah properly (especially with an adapter) – they are there for a reason! This is usually caused by a malfunction in the adapter jack itself. There’s a switch tab in the jack, which disconnects the battery positive when you insert a plug in the jack. If that switch can no longer make contact when there’s no adapter plug in the jack, the pedal won’t work with a battery. The best course of action is to simply replace the adapter jack itself. 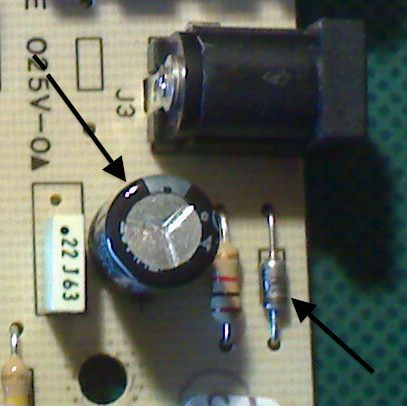 Either the inductor or the 4.7uF capacitor (electrolyte can) next to it is broken or has come loose. Check the solder joints and re-flow them. If that doesn’t do it, dig deeper. If you hear a volume change, it’s more likely to be the capacitor, so replace it (make sure to orient it the same way – the negative side is marked). If you instead hear a change in treble, it might be the inductor. 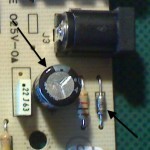 To verify if it is broken or not, you can use an ohmmeter to measure across the 33K (stock value) ”Q” resistor. If the inductor is ok, you should see a very low resistance (below 100 ohms). If it is broken, the resistance will be much closer to the actual value of that resistor. Check the black ground wire on the pot, to make sure it hasn’t come loose. The first thing to try is to disconnect the LED. If the wah then works as intended, the problem is probably the LED using too much current, in relation to the tiny current draw of the wah circuit. Make sure to use an LED that is as bright as possible in and of itself (look for ultra-bright LED’s), so you can use a larger current limiting resistor. The LED’s I use allow me to use a 6.8K or even 8.2K resistor, for as low current draw as possible. This also helps minimize switching noise due to current rushes, and it helps immensely with battery life – a win in all regards! Every amp has a resonance frequency (a point where the preamp is more sensitive). If your wah is set too sharply and hits that frequency, its inherent boost will inevitably cause distortion at that specific point in the sweep. The solution is to make the wah slightly ”flatter” – reduce the ”midrange” resistor value (stock value is 1.5K – I find 1.7-1.8K to be about perfect). If you have increased the gain by reducing the 390 ohm ”gain/bass” resistor, raising its value a little will also help.